I’ve written a number of published novels, including two stand-alone mysteries and six novels in The Church Choir Mysteries series. 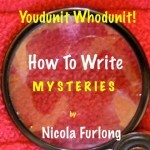 I have also created a non-fiction primer on mystery writing called Youdunit Whodunit!, another non-fiction primer on self-publishing called Self-Publish Your E-book in Minutes! and The Go-To-Gardening Cards, a portable and practical gardening guide for the Pacific Northwest. I’m the co-creator of a new multimedia platform called Quillr®. My first Quillr® is the supernatural thriller Unnatural States. YOUDUNIT WHODUNIT! HOW TO WRITE MYSTERIES : Improve your writing today with this short and practical primer on CRAFTING mystery stories. This e-book offers simple tricks and techniques, supported by concrete examples, which you can apply immediately to novels, short stories, screenplays, radio dramas or television scripts. Self-Publish Your Ebook in Minutes!